A lot of reptiles e.g. day geckos, skinks and tropical tortoises are occasionally adding fruits to their diet. 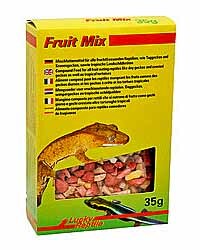 For all these species Lucky Reptile Fruit Mix offers a perfect food with freeze dried fruits and bee pollen. It can be fed wet or dry and is 100% natural. A treat your animals will love.